Jacob Dean was a wonderful Maker with which to work. He was both competent and knowledgeable. He was more than patient regarding the timeline associated with a municipal job and best of all, he had a great attitude throughout our journey. Thank you Jacob. We appreciate your thoughtfulness and effort in the creation of our sculpture. 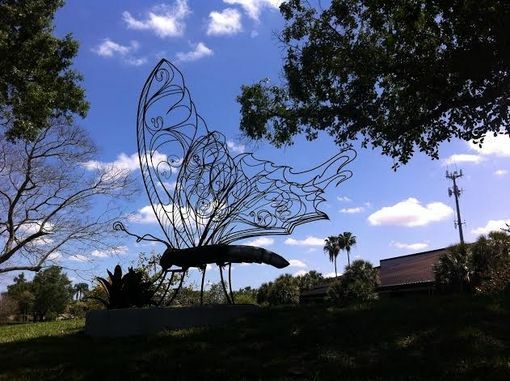 This piece is a public commission for the city of Coconut Creek Florida (aka) The Butterfly Capital of the World. Their interest in a large, rustic butterfly piece was posted here on Custommade.com. After some deliberation and design, we chose to create a Giant Swallowtail butterfly, after the Art Nouveau style, contour lined wings and solid sculpted body. The Butterfly is all fabricated steel, mostly recycled, but includes stock sections of Corten steel to preserve it from rust and decay. It stands 13 ft tall.